One of the most important goals of our organization is to contribute to the fight against TB, malaria and other infectious diseases, particularly in developing countries, where the problem is compounded by the spread of HIV-AIDS. The new product is the immunomodulator P-MAPA outlined below, which has been under development for the last 17 years by Farmabrasilis. It has already passed preclinical and pilot clinical trials. The new therapeutic approach is the reestablishment of immunocompetence of patients with infectious diseases, including those co-infected with HIV, by adjuvant immunotherapy with P-MAPA. A key aspect of this proposal is the scheme for universal use: P-MAPA is an affordable immunomodulator, obtained by a classical fungal fermentation process. No high technology needs to be involved. 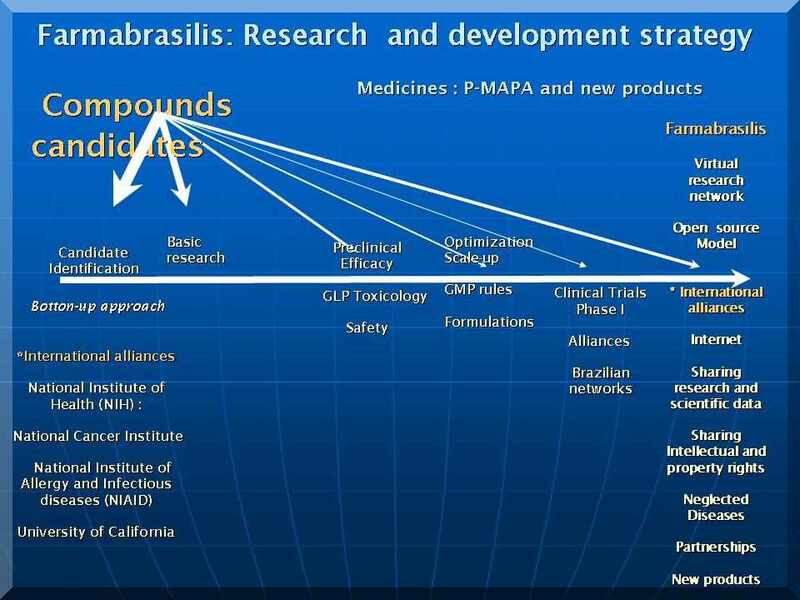 Farmabrasilis has developed a large-scale, low-cost production technology of P-MAPA, and is in a position to transfer the know-how to its partners, even in countries with no tradition of pharmaceutical manufacture. Emerging and reemerging diseases caused by intracellular pathogens, such as tuberculosis and malaria, are major causes of morbidity and mortality globally. The appearance of drug-resistant strains of several pathogens underlies the need for the development of new medicines, including those capable of boosting host immune response. This is important in infections by intracellular pathogens since conventional vaccines and antibody-based therapies are often partially or totally ineffective against such pathogens. A candidate to play this role is the immunomodulator P-MAPA. The immunomodulator P-MAPA is a proteinaceous aggregate of ammonium and magnesium phospholinoleate palmitoleate anhydride derived from A. oryzae. P-MAPA was originally intended for cancer treatment, and has effectively demonstrated anti-tumor activity in several mouse models.(1,*). Furthermore, recent advances in the understanding of its mechanism of action expanded its potential field of therapeutic application. Evidence is accumulating that the compound modulates the production of Interferon-gamma and interleukin-10 (background, details and references about this mechanism are provided below). Because these are key substances in the body defenses against TB, malaria and other infectious diseases caused by intracellular pathogens, it is reasonable to hypothesize that P-MAPA may be applicable to them. Experiments in animal models and pilot clinical trials in humans have repeatedly suggested that P-MAPA is able to reestablish the immunocompetence when the immune system is impaired by neoplasic or infectious diseases. Although an interaction between HIV and infectious diseases, such as TB and malaria, has not yet been definitely established, there is substantial evidence suggesting that these pathogens may interact and modify the pathogenesis of each disease. An important consequence for public health is that an efficient treatment of these concurrent infections may have the additional effect of retarding the spread and progression of HIV infection. Thus, the reasoning underlying our proposal for an immune-based therapy of infectious diseases is that an ineffective cell-mediated immune response is a characteristic feature of many diseases caused by a variety of intracellular pathogens, including M. tuberculosis. Ineffective immunity in these infections is often associated with depressed T-helper type 1 (Th1) cytokine response, and reduced production of Interferon-gamma. Interleukin-10 (IL-10) is thought to be a central mediator of the depressed Interferon-gamma response in diseases from intracellular pathogens (2). Likewise, during the course of HIV-1 infection, secretion of Th1 cytokines, such as Interleukin-2 (IL-2), and antiviral Interferon (Interferon-gamma), is generally decreased, whereas production of T helper type 2 (Th2) cytokines, IL-4 and IL-10 is increased (3).Because of these similarities in the mechanisms of infection of TB and HIV, exogenously produced Interferon-gamma has been used to attempt to reestablish host immunocompetence. In malaria, there is also strong evidence of a correlation between the use of exogenous Interferon-gamma and immunoprotection in experimental models against blood-stage forms of the parasite.(6). Althought immune-based therapy, mainly by administration of exogenous Interferon-gamma, is a promising path to treating these infectious diseases, it is still plagued by serious problems and dilemmas, such as occasionally severe side effects, and a very high cost, making it nearly impracticable for large-scale use in developing countries. In view of this, an innovative approach for treating these diseases would be to administer agents that enhance production of physiological amounts of Interferon-gamma through an immunoregulatory mechanism, and modulate IL-10 production. The immunomodulator P-MAPA seems to have this ability, possibly even under concomitant infection by HIV. In summary, there is evidence that P-MAPA induces proliferation of T lymphocytes, modulates cytokine production, mainly Interferon-gamma and Interleukin-2, and increases NK cell activity and nitric oxide (NO) release by macrophages (1) resulting in therapeutic effects in a remarkably wide range of pathologies - as expected from an immunomodulator - including infectious diseases caused by intracellular pathogens and cancer, both in animal models and in humans. Tuberculosis: P-MAPA is currently under investigation for its in vivo anti-Mycobacterium tuberculosis activity using murine models (C57BL/6 mice). Experimental data has shown that the compound significantly reduces the bacterial load in the lungs and spleen of treated animals. Further studies are in progress with appropriate animal models to evaluate its use in conjunction with current antimicrobials.(7). Visceral leishmaniaisis: In a veterinary clinical trial treatment of animals with the immunomodulator P-MAPA promoted a remarkable improvement in clinical signs and a significant reduction in parasite load in the skin of treated animal compared to controls. In peripheral blood mononuclear cell cultures, supernatants showed a decrease in IL-10 levels and an increase in IL-2 and IFN-γ. This findings are of high importance, since studies conducted in L. chagasi-infected individuals without active disease characterized the immune response to Leishmania antigens during early stage infection. Early immune changes were observed during infection, and an association was noted among absent or low lymphocyte proliferation, low IFN-γ production, and progression from infection to disease. These changes were associated with IL-10 production because the in vitro addition of anti-IL-10 reversed the changes. Punta toro virus : Punta Toro virus (PTV) has been shown to produce severe infection in mice, modeling the disease caused by the related highly pathogenic African Rift Valley fever phlebovirus in humans and domesticated ungulates. Punta Toro infection and disease in mice usually responds to immunomodulators that result in the induction of type I interferons and/or interferon-gamma. The PTV mouse disease model has facilitated the discovery of antivirals that are active against more biohazardous phleboviruses, such as Rift Valley Fever and Sandfly Fever viruses. Treatment with a single dose of P-MAPA, administered i.p. 24 h post-infectious challenge, was remarkably effective at preventing death due to Punta Toro virus (PTV) infection providing complete protection (100% survival), from an infectious dose that killed 65% of the mice in the saline placebo-treated group. This dose also reduced systemic viral burden and liver discoloration assayed on day 3 of infection (9). Listeriosis: In an animal model for the study of infection by intracellular pathogens, using Listeria monocytogenes-infected mice (Balb/C mice), experimental data has shown that previous treatment with P-MAPA stimulated myelopoiesis in a dose-dependent manner, and enhanced Interleukin-2 and Interferon-gamma production of post-challenged animals. Moreover, treatment with P-MAPA significantly reduced death of mice lethally infected with Listeria monocytogenes. The experiment has shown that P-MAPA can modulate the growth and differentiation of bone marrow granulocyte-macrophage progenitor cells (CFU-GM) and cytokine production, resulting in a remarkably increased resistance to bacterial infection(1). Malaria: In malaria animal model studies (C57BL/6 mice), experimental data has shown that treatment with different doses of P-MAPA in P. chabaudi infected mice and P. yoelii infected mice, in the blood stage of the disease, significantly reduced parasite proliferation(8). Because the action of P-MAPA is on the immune system rather than against the pathogens themselves, it is unlikely that it will cause the emergence of resistant varieties of tuberculosis and malaria parasites. In pre-clinical studies, no effect on virus replication was observed when P- MAPA was added in vitro to infected HIV-I-CEM cells. * Therefore, on the basis of currently available data, the compound is not expected to increase the replication of HIV in vivo. In addition, in pilot clinical trials for cancer and HIV, no interference with other medication has been observed. It is reasonable to expect that this will also hold true for medication for HIV, TB and malaria. The combined results of the above studies constitute strong evidence that: (a) P-MAPA is able to reestablish the immunocompetence when the immune system is impaired by neoplasic and infectious diseases, and (b) it does so through an immunomodulatory mechanism. If this is borne out by Phase II and Phase III clinical trials, this medicament is expected to have an extensive impact on the treatment of infectious diseases. If P-MAPA succeeds in reverting or minimizing the ineffective cellular immune response often associated with infections such as TB and malaria even in HIV-infected patients, its use in conjunction with other therapies may represent a significant advance in the treatment of these concurrent infections. An important consequence for public health is that an efficient treatment of these concurrent infections may have the effect of retarding the spread and progression of HIV infection. Of course it could also be deployed to combat these infections in non-HIV- infected patients, increasing the effectiveness of therapies currently in use. It may represent a new and powerful weapon in the therapeutic arsenal against MDR-TB and XDR-TB. Thus P-MAPA, in combination with current therapies, might be an important contribution to the treatment of infectious diseases caused by intracellular pathogens, such as TB. Together with the Farmabrasilis policy of cost-free licensing for disadvantaged populations, we hope that this approach will benefit large numbers of people in geographic regions with a high prevalence of HIV (10). Farmabrasilis welcomes new partners to help advance this project. We will be glad to discuss different partnership formats to pursue common goals. If there are your interests, click here to send us the form,or simply write an e-mail to [email protected] with your questions or proposal, and we reply as soom as possible. Farmabrasilis has four valuable assets to share with partners. Product. P-MAPA is one of the few medicines with immunotherapeutic action in the pipeline today that, according to evidence, could help face such major challenges as TB or malaria. Time savings. P-MAPA has 17 years of development behind it, and is ready for clinical trials. Cost savings. Achieving the current stage of development of P-MAPA usually requires massive amounts of funds. Expertise. The Farmabrasilis team has developed the product and its production process, and can also provide assistance in planning and executing clinical trials. Farmabrasilis is open to partnerships with individuals, groups or institutions committed to improving public health in different parts of the world. We expect our partners to agree to the Farmabrasilis basic policies. In particular, our licensing policy includes the possibility of royalty-exempt transference of technology in the case of neglected diseases and disadvantaged populations. This means that, in such cases, partners cannot sell the medicines or the technologies associated to them, nor gain any other direct or indirect benefits. Farmabrasilis is a non-profit research network congregating Brazilian, Chilean, American, and European scientists. Since 1987 it has been developing innovative and efficient medicaments for infectious diseases and cancer, with special emphasis on neglected diseases and disadvantaged populations. 1) Justo GZ, Duran N, Queiroz MLS. "Myelopoietic response in tumour-bearing mice by an aggregated polymer isolated from Aspergillus oryzae". Eur. J. Pharmacol. 2000, 388: 219-26; Melo A, Justo GZ, Queiroz MLS. "Stimulation of myelopoiesis in Listeria monocytogenes-infected mice by an aggregated polymer isolated from Aspergillus oryzae". Human. Exp. Toxicol. 2001, 20: 38-45; Justo GZ, Duran N, Queiroz MLS. "Natural killer cell activity, lymphocyte proliferation and cytokines profile in tumour-bearing mice treated with P-MAPA, a magnesium aggregated polymer from Aspergillus orizae". Immunopharm. Immunotoxicol 2003, 25: 305-19. N.BROMBERG JUSTO, G.Z. JUSTO, SEABRA A.B., DURAN N. - " Macrophage nitric oxide (NO) stimulation by an immunomodulator: P-MAPA " - Nitric Oxide 14 (2.006) - A 37 - P 064. (2) Gong J-H, Zhang M, Modlin RL, Lindsey PS, Iyer D, Lin Y, Barnesi PF. "Interleukin-10 downregulates Mycobacterium tuberculosis-induced Th1 responses and CTLA-4 expression". Infection and Immunity 1996, 64:3; 913-8. (4) Yola A, Sologub T, Nechaev V, Ivanov A. "Immune-based therapy using gamma interferon ingaron in the treatment of HIV/AIDS patients with active pulmonary tuberculosis (PTB) not previously highly active antiretroviral therapy (HAART)" Retrovirology 2006; 3 (Suppl 1):S38. (5) Suarez-Mendez R, García- García I, Fernández-Oliveira N, Quintana MV, Milanés-Virelles MT, Carbonell D, Machado-Molína D, Valenzuela-Silva CM, Lópes-Saura PA. "Adjuvant interferom gamma in patients with drug-resistant pulmonary tuberculosis: a pilot study". BMC Infectious Diseases 2004, 4:44. (6) Shear HL, Srinivasan R, Nolan T, Ng C. "Role of IFN-.gamma. in lethal and nonlethal malaria in susceptible and resistant murine hosts". J. Immunol. 1989, 143:2038-44; Hugosson E, Montgomery SM, Premji Z, Troye-Blomberg M, Björkman A. "IL-10 levels and clearance of P. falciparum higher IL-10 levels are associated with less effective clearance of Plasmodium falciparum parasites". Parasite Immunology, 2004, 26 (3): 111-7; Luty AJ, Lell B, Schmidt-Ott R, Lehman LG, Luckner D, Greve B, Matousek P, Herbich K, Schimid D, Migot-Nabias F, Deloron P, Nussenzweig RS, Kremsner PG. "Interferon-gamma responses are associated with resistance to reinfection with Plasmodium falciparum in young African children". J. Infect. Dis. 1999, 179(4):980-8. (7) Favaro WJ, Lenaerts A. et al " Effects of P-MAPA Immunomodulator on Toll-Like Receptors and p53: Potential Therapeutic Strategies for Infectious Diseases and Cancer.Infectious Agents and Cancer 2012, 7:14 ". (8) Duran M, Marcato P, Costa FTM, Duran N, Tasic L. "Structure and Antimalarial Activity of Immunomodulator P-MAPA". 2nd World Conference on Magic Bullets - Ehrlich II, Nürnberg, Germany 2008. Absctract 1216. Duran M, Costa FTM, Brocchi M., Lopes S, Tasic L, Nunes I, Duran N. "An immunomodulator against malaria infection". XXXII Congress of the Brazilian Society for Immunology-2008. Nunes I. "Building a new model for pharmaceuticals: P-MAPA, a novel immunomodulator against virus, bacterial, and protozoan infections". International Conference on Drug Design and Discovery for Developing Countries, Trieste, Italy, 2008, Abstract I-8-P85. (10) Fioravanti C. - " Strengthening our natural defences: a new drug candidate and a new approach to fighting infectious diseases " - The Lancet - Vol. 376- September 2010.